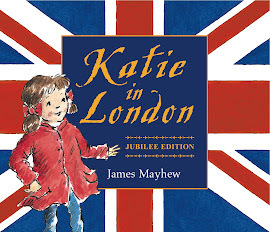 James Mayhew is the author behind the Katie books which introduce children to art at a young age. He has also brought the world of ballet to life through his Ella Bella books. James is in the midst of a busy summer, being involved in the Diamond Jubilee Pageant as well as collaborating in an exciting new venture with The Orchestra of the Music Makers and appearing at various festivals, including Hay Festival, Edinburgh Book Festival and the Pop-Up Festival. As the author of the Katie series, which introduce children to art and the Ella Bella books which explore the world of ballet, you obviously have a passion for sharing the arts with children. Were you introduced to art, theatre and music at a young age? It is a mission of mine to create books with a purpose, but which are fun too. I want to share the things in life that give me pleasure, and I meet so many adults unsure about how to enjoy art and music. If children grow up enjoying art and have that sense of ownership that familiarity brings, that’s a good thing. I grew up in a tiny Suffolk village so theatre and galleries were not available. But I loved looking at famous paintings in books, and my parents had a few classical records – Peter and the Wolf, William Tell, Peer Gynt… the usual things. And I loved how music could tell a story! Are you looking forward to being involved in the Diamond Jubilee Pageant this summer? What will you be doing on the day? Yes, very much! I love big community celebrations like this, it’s wonderful to be joyeous and optimistic. And I’ve always been interested in the Festival of Britain from a design point of view. I think the Battersea Park celebration and the Flotilla on the Thames will recapture some of that excitement. So I’m proud to be a tiny part of it. I’ll be telling patriotic stories and illustrating them upside down! We understand that you will be performing with The Orchestra of the Music Makers from Singapore this summer, appearing at both the Cheltenham and Lichfield music festivals. Can you tell us a little more about this exciting project and how it came about? It is a HUGE honour to be working with the superb Orchestra of the Music Makers. There will be over 100 players and this will be part of their European debut. They are performing one of my favourite pieces: Scheherazade by Rimsky-Korsakov. I will be retelling fabulous stories from the Arabian Nights and then creating live illustrations as they play the music! For several years now I have been working with an orchestra local to me (the de Havilland Philharmonic), and this came about through some storytellings – I retold The Firebird, and illustrated it in front of an audience, and the organizers suggested I add the music by Stravinsky. Contacts were made with this orchestra, who had been considering a family or educational concert. So we took a risk and tried the mix. I stand on stage – where a soloist would – and paint at an easel. This is filmed in real time and projected onto a big screen for all to see. It takes a huge amount of research and rehearsal to tally the stories and paintings with the music. One of the things I love is finding out what stories are behind the music. It is important to me to be true to the composers’ intentions. I think it’s pretty unique and I’m very excited to be taking it further afield to Cheltenham and Lichfield. You seem to have a busy few months ahead of you, with the music festivals and the Jubilee Pageant. Do you have any other children’s events coming up in the next few months? Can we look forward to any more Katie and Ella Bella books in the near future? Or are you working on any new books..? When you’re not busy working, do you have a favourite bookshop you like to visit? We have an excellent local bookshop, Davids, in Letchworth Garden City. I also have a fondness for Heffers in Cambridge – it’s where I met my wife! What’s the funniest thing a child has said to you during one of your book-related events for children? Just the other day I was drawing a dinosaur scene for some children. One boy asked me to add an “interrupting volcano” to the picture, which tickled me! Obviously I obliged! It would probably have to be a Moomin book by Tove Jansson. I’d choose Moominland Midwinter, my favourite in the series. Haunting, melancholy, yet funny and beautifully written, it also has superbly atmospheric drawings by Jansson. She was undoubtedly a genius!